Mats Burström: Treasured Memories. 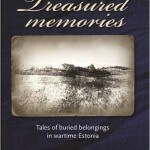 Tales of buried belongings in wartime Estonia. Lund, Nordic Academic Press (2012). In the autumn of 1944, around 70,000 people fled Estonia in the face of the Red Army advance. Most of them believed the Soviet occupation would be shortlived and they would soon be able to return home, so many of them hid the most valuable of their belongings they were unable to carry, burying them in ‘safe’ places. Until Stalin’s death in 1953, Estonians continued to bury objects to hide them, now for fear of deportation to Siberia. In Treasured memories, the archaeologist Mats Burström tells the stories of some of these hoards: the ones that remain buried, the ones that vanished, and the ones that were recovered and have found a place in new contexts. Their sheer variety brings together all levels of history, from personal memories to high politics, and reflects how events on the world stage can shape the fate of individual families, even across several generations. The book is also published in a sister volume in Swedish. This entry was posted on Friday, December 28th, 2012 at 03:21. It is filed under Uncategorized. You can follow any responses to this entry through the RSS 2.0 feed.